The Flight Deck Veterans Group and Cherrybend Pheasant Farm in partnership with R+L Carriers are proud to announce the 2016 Operation Cherrybend event on October 8th featuring platinum-selling country band, Lonestar, at The Murphy Theatre 50 W. Main Street. The annual event, founded by Nashville recording artist and Navy veteran Jared Ashley and Cherrybend’s Ellis Family, is meant to thank our nation’s wounded veterans and spread awareness for veterans issues. Tickets are $45 and can be purchased at themurphytheatre.org oroperationcherrybend.org. hunt and concert is back and bigger than ever with event sponsors R+L Carriers. 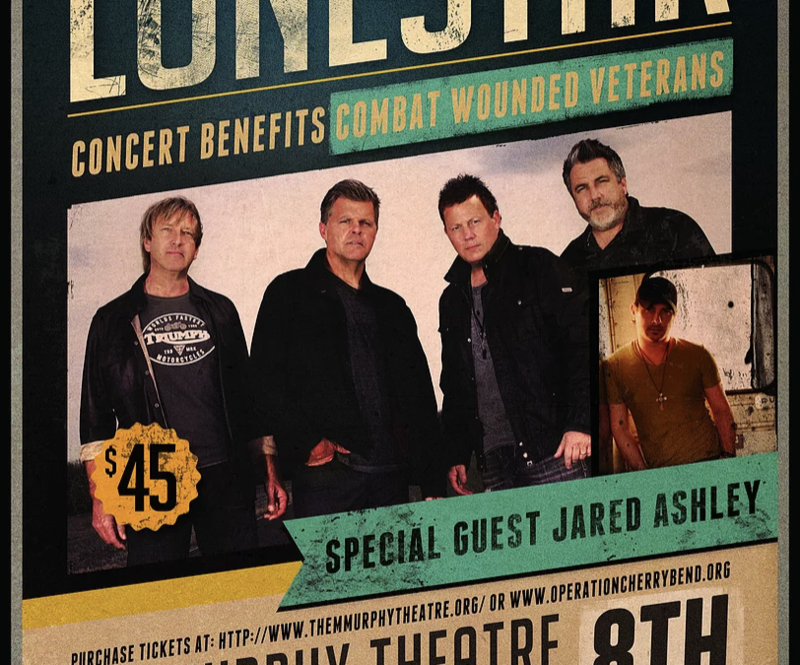 The night will feature Lonestar and Jared Ashley, who will take the stage after a Songwriters Round straight from Nashville featuring 2015 CCMA Songwriter of the Year Buddy Owens, Grammy winning songwriter Ray Stephenson (Willie Nelson, Blake Shelton, Kenny Chesney and more), Marine Corp. Veterans Daniel Dean and Sal Gonzalez and more. The mission of Operation Cherrybend is to thank veterans for their courage, selflessness and sacrifice to our country. “The more we educate the general public about the trials and ongoing challenges of wounded veterans, and veterans in general, the better understanding the public will have in order to meet their needs,” explains Beth Ellis, co-owner of Cherrybend Pheasant Farm. Twenty-two American veterans commit suicide daily, which Ashley hopes to bring awareness to and help change. The objective of the Flight Deck Veterans Group is to promote camaraderie between veterans of US Military Flight Deck Service. In doing so the goal is to support one another and pass on the history and legacy of our veterans and flight deck operations to each other and the public. The Flight Deck Veterans Group is a Veterans based volunteer driven, registered 501(c)(3) non-profit. Donations to Operation Cherrybend are tax-deductible to the extent allowed by law. To find out more about the Flight Deck Veterans Group please visit www.fdvg.org. Known for merging their country roots with strong melodies and rich vocals, Lonestar, comprised of Richie McDonald (lead vocals), Michael Britt (lead guitar & backing vocals), Keech Rainwater (drums), and Dean Sams (keyboards & backing vocals), has amassed RIAA-certified sales in excess of ten million album units since their national launch in 1995, and achieved ten #1 country hits including “No News,” “Come Crying To Me,” and their crossover smash “Amazed” (which was also #1 on the Billboard Hot 100, the first record since 1983’s “Islands in the Stream”, to top both charts). The band’s awards include a 1999 ACM Single of The Year for “Amazed” (the song also won the Song of the Year award), and the 2001 CMA Vocal Group of the Year. With over a 100 dates worldwide per year, they are celebrating over 20 years together. Lonestar’s highly anticipated album, Never Enders, is available now and features ten new original Lonestar songs that bring the band’s trademark sound into the contemporary arena.